Copyright 2000 Massa All rights reserved. This software can be used free. But, there is no guarantee. We aren't responsible even if a problem occurs by using this software. Send E-MAIL to us if you want to distribute this software in the outside. An image at the side of the explanation is a filter use result. (reduction). This page translated Japanese into English by using the translation software. How to install a filter. Make the folder of the favorite name in the ProgramFiles\Tacmi\Pixia\filter folder, and copy DLL. The filter of PIXIA is a DLL form. A DLL file can't be seen by the standard setup of Windows. Change the folder option of the windows, and try that you can see a DLL file. It is moved at random through all the pixels of the image within the setup range. An image is cut in the tile-shaped, and moved at random within the setup range. A frame around the tile, tile size, the color of the gap can be set up. An image is made black and white in the line-shaped. An image is changed like a metal. Three kinds of metals (gold, silver, copper) can be chosen. Blur an image in advance because it becomes a metal beautifully. 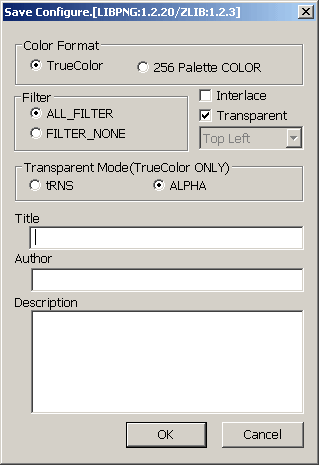 At this time, Blur in Standard menu of the filter dialog can be used. Moved in accordance with the setup after an image is divided into RGB. A character is arranged in the circle. Characters, font decoration, a drawing place can be set up. A complement explanation toward meaning of "Offset" to specify with the dialog. Specify the center angle of character drawing.The right is made 0. Specify 10 times of the angle of the left turn.For example, it is specified with "The top is 900. ", "The bottom left is 2250.". Expresses the movement of the object. A direction, a distance can be set up. An afterimage is drawn so that an image may move. A direction, a distance, the preservation rate of the ex-image can be set up. An image is supposed to be the film which is on white or the black paper, and the part of the film is made. A half transparent image can be made by using the mask-plane. This filter simulates the way of expressing it which exposes intentionally on the way to develop a film. It is the filter which reads WindowsMetaFile. This program expands the JPEG writing function of PIXIA. JPEG writing with original PIXIA can do only the change of the quality. 1. SamplingFactor of the image can be changed. 2. Comment can be filled up. 3. Progressive JPEG file can be made. 4. Preview (writing image and file size). It is useful to make an image for "WebSite" because it can be written with judging the quality of the image and file size. 1. Open "C : \ProgramFiles\Tacmi\Pixia\file_w" folder. 2. Replace "s_jpg.dll" in the folder with the file of the same name in the archives. An expansion function can be used when you write in a JPEG file by doing this work. This program expands the PNG writing function of PIXIA. The detailed way of using is here. 2. Replace "s_png.dll" in the folder with the file of the same name in the archives. An expansion function can be used when you write in a PNG file by doing this work.